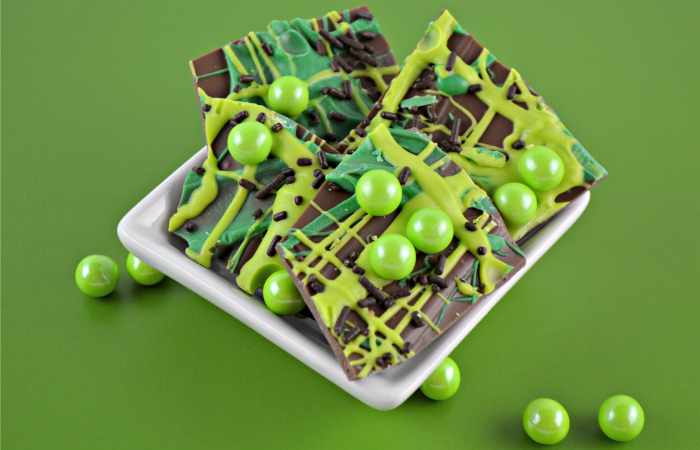 Kids LOVE Minecraft…and they will LOVE you when you make this Minecraft Creeper Chocolate Candy. Whether for a Minecraft-themed party, or just an afternoon snack this treat is delicious and easy to make. Line a cookie sheet with wax paper (wax side facing up). Place a good amount of each chocolate into 3 separate microwave safe bowls. Start by microwaving the light cocoa candy melts for 30 second increments, stirring after each increment until candy is melted. Spread the melted light cocoa candy across the wax paper and use the back end of a spoon to smooth the surface. Repeat step 3 with the green candy melts, then drizzle over the top of the light cocoa candy. Repeat step 3 again with the light green candy melts and again drizzle over the top. Add the Sixlets to the candy randomly. Work as fast as possible to ensure the Sixlets stick to the melted chocolate. Add the chocolate sprinkles, again as quickly as possible. Once hardened, break the chocolate into pieces by grabbing the back of the wax paper and using your hands to break the chocolate. Serve and enjoy!